Lors de notre voyage en Utah en septembre 2018 , nous avons utilisé votre livre comme référence. Nous avons vraiment économisé temps et argent par vos suggestions pour les couchés dans les BML et les campings dispersés ainsi que les randonnées proposées. During our trip in Utah in September 2018, we used your book as a reference. We saved a lot of money and time with your suggestions to sleep at BML and dispersed camping and also with the proposed hikes. Just a quick Thank You for a great job on the Frugal Shunpiker's Guides. I bought some of them a few years ago but haven't used them until now. I didn't realize how complete and informative they were, and I just wanted to say Thanks for the effort you've put into them. This is just a quick kudos -- no response needed. Thx for the Utah guidebook update! I've lived here for over 39 years, camping constantly and we've used a lot of local-only campgrounds, but we keep this book close by for the extra tips even locals don't know about. Love it! Keep up the good work! Thankyou for your prompt response. My biggest concern after losing everything on my computer was my photos, then your books. I’m glad to have them back where they belong. I want to say thank you for your book......it has been an absolute must for me....your outlines, details and tips are invaluable. We are also laying aside the RV resorts and plan to boondock as much as possible. We are pretty resilient, flexible and enjoy each other’s company.....so I think we’ll be fine. I simply wanted to let you know and say "THANKS" !!! Your guides have been my GO TO resourse and I am so pleased to have invested in them. Please let me know your preferred review provider and send me a link. I am heading into northern Utah, Idaho, Oregon, Washington, Wyoming and Montana.....and am bummed that you don't have books for those areas. Do you have any other recommendation of any resourse similar to yours for those areas? Thanks again......Crazy Jug Point was AMAZING!!!! I have your New Mexico, Arizona, and Utah guides. They have been extremely helpful in New Mexico and Arizona. We haven’t made it to Utah yet, but should be there in about 2 weeks. We don’t boondock a lot, but what we have done was all based on your guides, and has been great. I have found your campground info and ‘sites to see’ info really helpful. We really loved the Mesa campground near Gila Cliff Dwellings. That you chose to collect and publish all of your travel data is of great value to a very large number of travelers. Even though I have lived and travelled extensively in the Southwest (since leaving North Carolina in 1967) I still find your information very useful. Thanks again for all the hours you have put in to make all of this possible. We are planning a 1 to 2 month trip leaving around Sept 6, hitting Northeat Washington, then onto North Idaho, over to Glacier National Park, maybe onto North Dakota, down to Wyoming (Devil's Tower), then Colorado. All the places we miss when we go to the Southwest in the winter. But I am feeling completely lost without my Marianne to tell me where to boondock, which hikes, campgrounds, towns, dump stations, crowdless places to go!I LOVE your guides for the southwest states and brag about you ALL the time! Are you aware of any resources similar to yours that could help us? Just want to Thank-You :) The E- books that I bought from you were a real asset to our travels!! We left March 24 and returned April 14 2017 (not long enough). At first when I told my wife about dispersed camping she was unsure of doing this, but she really got into it. We even bought a US cricket phone and plan so she could research more information for camping and areas to hike and collect many rocks! Your information was top notch and we passed your website information onto many other travelers for you. We started out in Moab, Utah area, then to Zion Park, then between Sedona and Cottonwood, Arizona. I have to tell you I just completed a 2.5 week Utah trip with my 2 boys and your Utah Shunpiker's Book was invaluable. Our original plan was to visit the Mighty 5 and I loosely "planned" to follow portions of your itinerary. I was a little nervous about being able to find the boondocking sites you identified when I was first reading the book and had no idea whether sites would be available when we showed up or what to expect. But between your GPS coordinates, mileages and detailed descriptions, we were never guessing at where we should be and every detail you included was accurate, whether it was a warning about rocks at the entrance of a site or to look for a grove of trees or any other such description. After locating our first site outside Zion NP, I was so relieved knowing I didn't need to panic subsequent nights ---I don't relish the idea of the sun setting and being unable to find a place to stop for the night with kids in the RV counting on me to know what I'm doing. It's not like we were near WalMarts, rest stops or Travel Centers like when we travel across the country! Even when we had to wait out some weather, we were able to go down to Page, AZ even though I knew nothing of the area and not only did we find a place to stay for a few days, but we followed your guide for activities and RV-friendly services all for free. Every evening of our trip, I would pull out your guide and look to see what hikes and sites we would encounter and we ended up being able to do so many additional activities than we had planned because you provided such user-friendly info. I could go on and on but I just want you to know I'm so grateful for your books and now have three of them I intend to use on future trips as my kids and I are roadschooling much of this year. Thanks for all the diligent work you put into these guidebooks!!! I just want to thank you for including us on your "RV Travel Blog" page! I also want to let you know that we purchased your RV Boondocking in Southern Utah when we first got on the road and have really enjoyed how useful it is. Thanks for making it available to other RVers. I wanted to thank you for your book which was a great help in order to find a place to sleep in our camper van. Indeed, we went last year in July to California and Nevada and Sequoia National Park.Everything was well explained and the geographic coordinates were very helpful too! !I'll definitely recommend you to my family and friends. We just got back from a 4 week trip in the Southwest. Used your Shunpikers guides often and they were spot on. We loved your comments, advice, gps coordinates, ideas......told 3 or 4 people about them. I would like to praise you and these guides on the Roadtrek forum on Facebook. Are you ok with this? My wife and I bought a 24 ft travel trailer and our first ever trip to the SW USA was from late February to mid April 2015. In researching before our travels I found your Arizona guide and bought it for my iPad. We found it absolutely marvelous, not only did it save us dollars but it is a wealth of travel info about interesting places that we would never have discovered without it. Also we were stuck Easter weekend not being able to get a campsite at the Grand Canyon but with the guide we found a great campsite for 4 days near Tusayen, and free! As a result we have now bought your guides to Texas, New Mexico and the two California guides for our travels this coming winter. I also tell others what great info they contain.Thanks for your great work and happy travels. Hi Marianne - just wanted to say THANK YOU for sending me this updated copy. You are AWESOME! One of the best value purchases EVER! As further proof of my gratitude, I even joined Boondockers Welcome with a paid 3-Year Membership...and I don't even own an RV quite yet! (shopping online). Thank you, thank you, thank you! Just wanted to let you know we really appreciate the hard work it takes with you sharing your experiences and knowledge of places stayed throughout your travels. It has been a great help for us. We started fulltiming 3 years ago and like to boondock whenever we can. Your guides have been an excellent source for low or no cost RV locations. I sort of have to temper it a little since we have a 40’ MH and I think yours is a little shorter. Thanks again and keep up the good work. I operate an offroad RV rental Business in Golden Colorado. We do custom itineraries and I reference your guides for dispersed camping spots when I am not familiar with the area that our renters are traveling in. Great job on the descriptions. Thanks for the update of the guide. We spent 2 months this spring in Arizona and Utah and used you guides extensively to help locate some of your more remote attraction suggestions. We haven’t boondocked on our previous trips to the Southwest but we did a fair amount this time. I think our favorite was Valley of the Gods. Native American cultural sites were the focus of this trip, so a special thanks for the petroglyph tip on page 37 of the Utah Guide. The hike across the trackless sagebrush flat added a sense of discovery to the most excellent petroglyph panel you described. Sego Canyon was also a treat. Anyway, thanks again for sharing all you experience, We are now ardent fans of boondocking. Just wanted to thank you for the update. It seems so rare nowadays for self-publishers to provide updates for free, and I for one appreciate it. Actually you've also motivated me to move ahead on updating my own van camping book, so I guess I should thank you twice! I recently won a copy of your Shunpikers guides and this past September my husband, Robert, and I hit the road for our 3rd annual trek across country. CT to San Diego in three months.Your guides are impeccably written with attention to the details that we appreciate. Your notes regarding road surfaces is particularly helpful. We have thoroughly enjoyed and appreciated them and your attention to detail is right on. Know that your efforts do not go unnoticed in our camping experiences! We thank you again and again every time we pick up your Shunpikers guide. "Glad to have one". Thanks for the update Marianne. We spent 6 weeks touring the southern states this summer and found your guides invaluable.Thanks so much for sharing your knowledge. We bought a SeaEagle kayak as a result of your books, although we chose the 385FT Fast track model. We’re very happy with it and it fits under the power sofa in our Roadtrek 190P next to the BBQ. We keep the paddles and PFDs in the outside lower storage bay and the seats behind the van’s driver seat. We want to thank you so much for your work. We left Quebec last Christmas and traveled trough NM, AZ, CA, UT, following your path. Your travel guides are so helpfull to find hinden places we never would have found without you. Congratulation too for the perfect french translation. Since we always stop on your prefered spots we will leave you room if you come by. We love your books and would follow you anywhere! Just to let you know. I was looking at the FAQ and I read the question from the person who thought you should give out your books/information for free. When I told my husband about this he said "I would pay a $100.00 for a book. We saved way more than that. The person who wants the book for free doesn't realize the time and effort they put into the books!" We found the RV Boondocking Guide to New Mexico very helpful on our recent trip to New Mexico. We stayed at three wonderful campgrounds mentioned in your book that I doubt we would have found otherwise. Well, four nights for $36.50. Not as good as you folks but about the price of one night in a public campground in Santa Fe. We travel in a 25 foot Class C.
Marianne - thanks for the New Mexico update — we are planning a trip out there this winter so the timing is great. Your free updates are such a value-added feature of your guides — sort of unheard of in this day and age but such a great service to your customers. Safe journeys. Thank you Marianne for the updated version. We followed your suggested route in 2012-13 and it was invaluable..so much information and we would have missed many of the tucked away gems if we hadn't had your guide. Hoping to return to New Mexico and will again follow your travels. Thanks for all the work to create this resource for all us shunpikers! I just bought your 6 Frugal Shunpikers Guides and have started to read through your California guide to prepare for future travel in the States. Thank you for the wonderful work of detailing what a traveler needs to know before venturing south (like what passes are required, local parking regulations, and dangers like poison oak), and for the descriptions of some of the attractions along the way. These are what I was looking for. I'm lost if I travel without guidebooks and a guidebook on how to save money along the way is priceless. We just returned from 7 weeks that saw us travel from Vancouver, down the west coast, through California, Las Vegas, Utah, the North Rim of the Grand Canyon and back via Yellowstone. We received your update and just wanted to pass along how much we enjoyed your Utah book. We seldom find guides that match our interests as closely as yours. We do the southwest every couple of years (in a RoadTrek) and are always looking for the out-of-the way attraction and camp site. This spring we hope to cover southern Utah. I’m in the process of plotting each of your GPS coordinates onto Google Earth so I can plan out my route.Thanks again for a wonderful tool-kit. PS – I just purchased three more of you Frugal Shunpikers Guides and look forward to putting them to good use. I've lived in the San Francisco Bay area all my life and gone on countless camping trips here. I've been to most of the places you mention in the book but still did pick up a number of useful ideas. Thank you very much and I look forward to buying some of your other ebooks that cover areas I'm not nearly so familiar with. Marianne, thanks for the update. I continue to be impressed with the accuracy, thoroughness, and usefulness of your Frugal Shunpiker's guides (I have two). And your service orientation continues to justify the trust that we place in your guides when traveling. We used the first two to put together our 11-week trip to AZ and NM, and to guide us while vagabonding around out there. Your guide made our “trip of a lifetime” possible. (Of course now we know that it doesn’t have to be just once in a lifetime :). ) When people ask us how we found all those great spots in our photos, we tell them about your Frugal Shunpikers Guides; and when experienced RVers ask if we’ve ever been to “spot X,” we can usually tell them yes (we learned about it from Marianne) or no (but it’s in Marianne’s guide). What a great comfort to have a trustworthy guide (let alone how it made us ‘instant experts’ on the area, lol). Thank you so much for your work and your care. I just purchased the Sierra and Coastal version of your RV guide. As a local, I found it very comprehensive and well-written. Wonderful resourse. We had the most wonderful paddle on Watson Lake near Prescott, AZ yesterday. Something we never would have discovered without your book. Thanks for sharing all your secrets! We look forward to exploring many more of them. We were also the FIRST and ONLY campers in the campground on their first night of the season. Can’t imagine next month in Colorado without one of your books to guide us. Thank you again so much, we have done much of what you suggest and enjoyed every one of them! Our trip was great, in large part thanks to your ebooks on NM and AZ. We did a lot more boondocking and cheap-docking (because of the 50% discount) than before, and also tried our first Boondockerswelcome visit south of Sierra Vista AZ, a great experience. We loved all the places you mentioned. Just wanted to say, "Thank you so much" for all the work you have done on these marvelous books -- and for so little money. You deserve a Humanitarian Award! We love them and will be traveling south again, starting with Utah in September, using your Frugal Shunpikers Guides all the way! We just got back from a 7-week trip through the Southwest, and I just wanted to say your guides were very useful. We camped at quite a few of the places that you list, campsites that we would NEVER have found without your guide. Thank you for your updated Utah ebook. We are full timers who live mostly in Colorado and usually Arizona in the winter. Even though I grew up exploring Colo, Utah and Ariz I have found many new spots thanks to your books. We have recommended it to at least a dozen of our traveling friends. This is a wonderful resource! Thank you! My son has autism and I like to take him camping a lot to de-stress and "just be". He can't deal with campgrounds because other people are too nearby. We have a pop-up which we take all over, but knowing where to go is tough. Your documents are a godsend for us. Thank you! Thank you for the update Marianne. Very thoughtful of you. I got so much out of the book when I traveled through Southern Utah last fall. I was traveling alone and shot an instructional dvd called Yoga-Dance that is just now being released. Would love for you to check out the trailer on my website, www.beththesybil.com,	so you can see a sampling of the marvelous locations you helped me find. You also helped me just become more comfortable with finding my own places on back BLM roads that I never would have done if you did not hold my hand and get me started. :0) Now I never want to pay for camping. It just feels so empowering to not have to interface with any humans to give me permission to lay my head on the Earth. Thank you for helping me grow and expand! I have been travelling to the Southwest for @ 30 years.....on motorcycles with a group of guys. I thought I knew the area, but your guides are absolutely terrific.....had no idea how much I have missed! My wife and I are in our early 60's . We downloaded your book on Wednesday and it enticed us so much, we decided to take off two days later. We visited several national parks........and the tip you provided on the Senior Pass saved us enough money to pay for all of your guide books! We referenced your guides often and cannot wait until Spring so that we can get on the road again!! Thank you so much for all of your information and effort in putting these guides together. Thank you for the Arizona update and all your booklets. Last year we spent about 3 months in Arizona, New Mexico and Utah. We rapidly discovered that your booklets will be our main guides! Instead of being squeezed with our little Airstream every night between two giant RVs in campgrounds, you made us discover fantastic open locations with marvelous views far away from the traffic, where we were alone, and for free! Even at locations receiving millions of visitors we enjoyed your lonely places, like the splendid pine forest (where we were alone) a few miles away from the Grand Canyon next to the official federal campground, crowded, expensive and hardly beautiful! Thanks to your booklets, our mean cost of overnight camping was 5 dollars! We are looking forward to go to California and use your 2 other booklets! Thank you so much for your Frugal Shunpikers guides. They have been so valuable! The updates are certainly a bonus! Happy travels. Thanks for the update. We have used your Frugal Shunpikers guides many times....very worthwhile. It's great to have your updated version. Thanks Marianne! There is no other book like yours. We use it a lot! We just came from Sedona and the Grand Canyon and your recommendations were right on! Thanks again! Thanks, once again. You provide a great service. I won't be able to use your guides the rest of this year, but hope to be on the road early in 2014. For many years I have been spending seven or eight months 'on the road' mostly in TX, NM, and AZ. Your guides have led the way. I hope you still enjoy. I do. You help. Your book is very useful for us. We follow your advice all the time. We are on our trip since November 15, 2012 and, following your guide, have visited the Grand Canyon, Page ( Lone Rock), Lee’s Ferry, Sedona, Prescott, and now are in Lake Havasu City. Once again, thank you for your book. Just got back from California coast trip. Went tent camping, kayaking and biking. Used your new CA guide extensively. We found it to be invaluable especially traveling w/o reservations. Thanks so much! We spent lots of time in Utah and Arizona last fall and winter and your guides were very helpful!!! We explored more areas than we would have done without your information. Just wanted to tell you how much I've enjoyed your Arizona and Utah books. I'm going to read through the California book next and save the New Mexico book for last. Your approach to travel, hiking, and camping closely aligns with ours so your books are especially valuable. I purchased your ebook on New Mexico and we had a wonderful time following your recommendations. I referred to you so much during our travels that my wife now refers to you as my girlfriend! We would like to travel to Colorado and wondered if you have a travel guide for that State? Once again thank you so much for an excellent publication and we wish you much success with your efforts. I want to tell you how much I am enjoying your books. So much so that when I first saw them, my son Matthew asked me what I wanted for Christmas, and I told him I wanted your books. I have told many people who question me about boondocking to visit your website. You've done your homework and, for me, it's like a treasure hunt, following your travels. It has sure made it easier and more affordable to travel since I'm only here for a few short months...no time to experiment! Bruce and I are in California right now following your California guide. We love them all!! We have gone places and seen things we never would have if it weren't for your Frugal shunpikers guides. We have been able to spend the last three winters down south because of your e-books. We can't tell you enough how we have loved and used them. Keep up your super work. Your Arizona guide is the greatest, Marianne! We bought a copy when it first came out and, thanks to you, have found a way to get away from the crowds and save a bunch of money snowbirding. The free updates are so appreciated! In an era of declining care and concern for customers, it is so refreshing to see service beyond the sale. I so often am diappointed in travel guides as they are not aligned with my values and beliefs - too expensive listings, too commerical of places, etc. I had read the reviews and figured that even if we saved one night in camping fees, I could justify the purchase. I was surfing the net and came across many recommendations for your books on websites of folks we like to follow - outdoorsie & athletic. What we like most about your writing is that it's nature-destination-oriented. We like to hike and bike and see beautiful landsapes. So your books are aligned with our values and beliefs. I do think that the 30-day itinerary will be extended into many months or more for hubby & myself. I appreciate the time and effort that you have put into your writing!!! Much appreciated!!! Your aticle on the Stillwell Ranch in Texas intrigued me. We are on our way to Texas now. We enjoyed all four of your ebooks. We had our copies made into books for easier access. Staples Office Supply only charged around $25.00. They are worth more than we have invested. I appreciate the bits in your guide that veer into opinion, because I share them (so far). I read a story back when I was even more naïve about Southwest politics about a US citizen who was sentenced to prison and also fined $10,000 for leaving water near the border. It made me sick and disgusted that this is who we are now. Did I ever tell you that you guys are the reason we boondock? Our plan started off completely not like this. We were just trying to figure out how to get to the southwest with all our cats. Then we read about boondocking, and we saw your pictures and started looking around for other strange people like you. The cats feel entirely differently about you, however. They're still saying but you SAID there would be a house! What a fabulous job you have done - I can't thank you enough for your Boondocking books. They have been incredibly helpful. I can see how much work you put into them. They have saved us hundreds and hundreds of dollars and hours and hours of trip planning. I have even been teased by other RVers for being such a Marianne follower! We will buy your California book for next winter. And I'm wondering whether you are working on Louisiana, Alabama and Mississippi. Don and I left Ottawa October 30, 2010 and took your route via Detroit, Nashville and Natchez. We have used your books to "do" southern Texas, New Mexico and Arizona. They have been fabulously useful. Several months ago we ordered your on-line book. We are retired (live in Oregon)and traveling all over the U.S.A. in a 32' motor home towing our car. I was skeptical about some of the places you described since your RV is smaller than ours... Not to fear! We can't thank you enough for GREAT directions, FABULOUS advise, all of your KNOWLEDGE and WONDERFUL suggestions! We followed your tracks (in reverse order, we came into Texas via El Paso). The things we wanted to see and do were accurately described by you and very valuable information. We are sorry to be leaving Texas because we don't have "you" to guide us any more :) Toward the end of May we'll be going thru Washington, DC, New York and on up to Maine. Wish we had another Marianne book to follow! We wanted you to know how much we appreciate you and your book! Thanks again!!! I've signed up for your newsletter and just purchased three of your guidebooks. We spent most of last year designing and purchasing a Sportsmobile Class B on a Dodge (really Mercedes) Sprinter chassis. We will be using it around here, which includes southern Utah, Arizona, and New Mexico, so your guidebooks are perfect for us. We have never had any interest in staying at a campground where the population density is 10 times what it is in our neighborhood. So we have been boondocking for years, and I've already spotted some of our favorite spots in just a quick glance at your Utah book, but you have many places that we have not discovered, too. At the end of October we purchased your four Frugal Shunpiker Guides, which are so far proving to be invaluable to us on our maiden RV voyage to the southwest. We are spending quite a bit of time in New Mexico as we have never realized what a spectacular state it truly is. We are using your guide a lot and haven't been disappointed yet! Thanks again for all of your great work on your guides. The information is tremendously helpful, and we're having the time of our lives. Just wanted to let you know we are now in Texas and followed your directions all the way down. Your comments, advice and suggestions were bang on. What a relief to know we can depend on your recommendations and not worry about where to camp the next night. I was afraid I would find a thousand other travellers all following the same advice and clogging up all those free "shunpiking" sites; not the case, no need to worry. Tennessee has a lovely new visitors' center, just opened in October. Ohio rest areas have wifi available for $2.00/hour. I'll keep you posted as we travel and you can check out our blog site for pictures of places you have recommended. We are so glad to be travelling with your books. At night we go through your pages to see what is coming up next day. We also transfer important points to our CAA maps. Thanks again for such wonderful helpful books. Thank you! I like your writing style and the Frugal Shunpikers Guides are really well laid out. I'm looking forward to putting them to practical use! Thank you so much - I had no problem with the download. We usually only 'dry camp' in our camper....although I love the name Boondocking - Much better! So....thanks for the information as we are getting excited about an upcoming trip to North Rim of Grand Canyon/Zion/Bryce!! Your information is priceless!!! I just discovered and bought your 4 PDF Frugal Shunpikers guides -- terrific! I know AZ, NM, and UT very well, yet discovered much valuable new information. Your writings and webpages are beautifully done. I've been living full-time since 2001 in an Alaskan camper on a F-350 4x4 diesel truck modified for very rough off-road use, and I wouldn't have it any other way. Have probably paid for overnight camping 20 times in 9 years, so I appreciate your approach. I'm looking forward to re-exploring using your guides. I congratulate you on the Frugal Shunpikers guide for New Mexico, and for the Basic Boondocking book. They both are top draw -- great writing. Keep up the good work. I purchased your Utah book for a trip we took last July. Because I don’t like crowds, I wanted to find some good, off-the-beaten-path camping spots where we could be alone. For this reason, and the fact that I am cheap and wanted free camping, I bought your book. Near Bryce, we stayed at the place you mention on page 44. It was high season and Bryce was packed but we were all alone at this wonderful spot. Thank you for the great resource. As we continue our motorhoming experiences, we will continue benefiting from yours. After a three month trip, using your guidebooks every step of the way, we are back. What a trip.The weather was crazy and made us change our plans a few times during the trip. We were starting out with your guide to Texas, planning to drive down to Padre Island and follow through with a visit to Big Bend. Well, let's just say that when we woke up in Marathon (the morning before heading down towards Big Bend) to find our motorhome transformed into an ice sculpture, we decided to head out to Arizona asap. The trip was wonderful. We followed your guides through most of it. All in all, a wonderful experience and your guidebooks were very helpful. As soon as I finish looking through the 3,000 or so photos, (!) I will send you a couple with more notes as I have kept a diary of our trip. We are from Michigan and have traveled to 16 countries, 11 provinces of Canada and all 50 states all on a shoestring. People just don't realize how cheaply they can have the most fabulous vacations. AND YET you have discovered some of the most terrific places. "Free camping" wow! We do this whenever we can, but to have it in a book, it is an answer to our travel problems. We have searched the Internet for just such a perfect guide and Internet site and there you are. Thank you, thank you, thank you. This year Mach/April I travelled through California, Arizona and New Mexico and I used your guides with a lot of pleasure. Normally I live in Austria (originally I am Dutch) but I am already saving money to return to the States, I hope next year Oct/Nov. Looking forward to it. Downloading your Texas boondocking book and reading it was a highlight of today! Fantastic! You're obviously very skilled at synthesizing information and organizing it into a wonderful, usable format. Love all the suggestions too. Am looking forward to doing more boondocking now. I just finished a 13 month trip with my 3 kids via RV, that included 28 countries. Time to enjoy the U.S. for awhile! Thanks for all your hard work - I really appreciate it. Well, on my 6th day here in Arizona and your e book information has been invaluble - haven't paid for a camp site yet!!!! I love all the info on the sights and hikes etc...one complaint though, the boondocking you describe at the Grand Canyon south rim, in the forest - I stayed there last night and there were NO elk in my campsite, I demand a refund!!!!!!!! Just kidding. I am in Utah today for three weeks. Any chance you could send me a rough draft of the Utah e-book? Thanks again. I am a traveler via bicycle. Like you, I try to find places to camp for free or for little money.Your books are terrific and I look forward to following many of your trails. I pull a Croozer trailer with camping gear and have a hand-held PC for wireless communication. Of course, I have a cell phone... who doesn't? At the end of June I start a future without boundaries - basically living on my bicycle while traveling throughout the country. Just wanted to send you a short note to say thank you! I was in New Mexico last week and had my first chance to rely on your great eBooks. Admitadely I took the easy route and stayed at the Blue Water State Park, but I wouldn't have known about it were it not for you. Thanks for the great books & good luck with your business! "The world's first fully sutainable 4x4 round-the-world family sized expedition vehicle"
Complete with a comprehensive table of contents and index, maps, and pictures, these e-books are very professionally designed. My favourite part is the 'tips' sidebars. The books will also appeal to campers (ie. tenters) as Marianne offers plenty of information for them, too. In addition to boondocking information, she also offers suggestions for what to see and how to get there. In short, all three books about frugal shunpiking through the southern US are comprehensive tomes on how to get to the state and tour the state frugally while making sure that you see what needs to be seen. I don't know how you did it. I really thought we had found most of the free and cheap camping in our neighbor state. But your Frugal Shunpiker's Guides list about 40 places we hadn't discovered. The funny thing is, we've probably passed very close by to them on several trips and paid dearly for camping instead. The guide is definitely going with us on our next trip which, with this new information, should be a lot cheaper so may be sooner than we had hoped. THANK YOU! For your quick response and help with the download. To travel the incredibly diverse and beautiful southwest part of Utah without the book: RV BOONDOCKING IN SOUTHERN UTAH, is a real handicap. Straightforward and very informative! 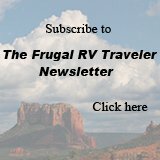 These are a series of e books that I can highly recommend (The Frugal Shunpiker's Guides) for the frugal rv camper and one of them is specific to Utah. I have used these books and even have them on my I-Phone. Now let me warn you this is for the frugal traveler so do not expect RV resorts with swimming pools etc. I was trying to get enough information for a fall trip to the Grand Canyon and points beyond but it's hard to know what to expect. Now that I bought your Arizona Frugel Shunpiker's Guide it answered many of my questions. I can hardly believe there's places to camp for free so close to the parks. My VW bus and I will certainly follow the route you suggest. We had the Internet and Don Wright's free campgrounds book but in the end we found most of our free camping listed in your guide (RV Boondocking In Southern Texas). Because you had just been there, we knew we could trust that these places still existed. You didn't let us down. Your information was "spot on". Thank you. We really enjoy your e-book about frugal boondocking and shunpiking in Arizona. We have used it for the past month while traveling through SE Arizona and we continue to use it regularly. We are planning to head toward California, and wondered why you haven't written anything about the subject for that state. Are there any resources we may purchase or find over the Internet about boondocking in California? Thank you again. Any advice you may have will be greatly appreciated. "More, More, More !! Hi guys. I ordered your e-book last week, and devoured every last word. I love reading about RVing on a budget. I loved your e-book, more so than other resources, because we totally relate to it. We believe in living simply. Our time together and freedom mean more to us than a fat bank account. Also, because you are Canadian, you understand the laws that govern crossing the border and travel in the U.S. It seems that not a day goes by, that I don't find myself daydreaming, for a moment or two, about hitting the road and seeing this great country of ours. Reading about your travels gives me the encouragement I need to follow those dreams. I am looking forward to receiving my next e-book and wanted to encourage you, that there is an RVing couple on the prairies eagerly awaiting the growth of your web page and the release of your next books!! Very well done !! I just finished enjoying the Guide to Arizona, and I must say that I am very impressed. While I was reading the guide, it felt like you were literally holding our hands, and leading the way for us. This has totally eliminated the anxiety that we would sometimes feel about our future plans. It was bittersweet to finish the guide, because I was enjoying it so much. I must have looked kind of funny, with my huge map of Arizona, a marker, and of course, a hot cup of coffee. Everywhere I read about, I found on the map, and imagined how great it will be, when I am using my guide for real!! On our recent month-long RV trip to Texas our printed version of "The Frugal Shunpiker's Guide" literally became coffee-stained from the amount of usage it got. We were absolutely amazed to be camping right on the beach and in other beautiful campgrounds for free or almost no cost. We would never have known about or discovered these places without the guide. Not having done much boondocking in the past, we were also very grateful to the special tips and advice offered in that respect. We won't go on another trip to the States without a copy of the Frugal Shunpiker's Guides for each area we plan to visit. We highly recommend "The Frugal Shunpiker's Guide." As veteran "Winter Texans" we have traveled extensively in southern Texas. Even with all our experience we were still able to learn about new places to visit, camp, and inexpensive ideas and tips on living frugally on the road, in this handy guide. I have been reading a ton of ebooks and I wish they were all as informative and intelligently written as your three guides. How you choose to travel, the places you pick to go, are exactly what I like! Your guidebooks are pleasant to read, well researched, opinionated in a good way, and chock full of smart advice. I'm currently "camped" (I have a 74 GMC Motorhome, 23 ft.) at Aguirre Springs watching the sun come up over White Sands. I'm the only one here in spite of New Mexico's State Parks being shut down this Thursday and Friday. By the way, your writing has been very helpful to me as I travel with a five year old black lab and we like finding places that she can roam and sniff. She is a food thief so I dare not let her leashless near other campers. I was able to download and print your ebook with no problems, and let me tell you...I absolutely LOVE it! I'll be in Southern Texas this winter some, so perhaps we'll run into you and your husband! Thanks so much for writing the book; you did a great job of it too! Thank You! I found the guide very very helpful. I especially found the advice about some of the free camping areas helpful, as I never would have stayed at any of them without your guide! I was very impressed by all three of these books, one each for New Mexico, Arizona, and Texas. They detail suggested routes for touring these states, complete with affordable and free dry camping spots along the way. Of particular interest to Canadians is the fact that Marianne is a Canadian! I've heard great things about how cheap it is to boondock in New Mexico, but her book on the state is the only resource I've found that explains in detail how a Canadian can benefit from the New Mexico parks policy. Thank you for my review copy of "RV Boondocking In New Mexico". Although the true test will be in using it, I can already tell that the information is invaluable. Your Frugal Shunpiker's Guides to Arizona and Texas saved us lots of money last year, (not to mention, opened our minds about camping without hook-ups ... that it's a great option to campgrounds). We've been recommending your guides to all our RVing friends. Keep up the good work! I have been wanting to write you since the day I started using your books (which was immediately, lol!) I love them. I have only used Arizona so far but it is a great resource for me. In fact, I raved about it so much, my buddy Patrick ordered the same series from you and I am sure that you will be getting a request for the Utah book from him as well. I am enjoying your eBooks and planning my next trip! I have traveled across Texas from one end to the other several times, and yet I learned from your book about an incredible number of wonderful places to visit and to camp that I somehow missed, although in some cases I passed within a few miles of them without being aware of it. I was so pleased with that first eBook that I had to get the rest of them, as I also camp in Arizona, New Mexico and Utah. Looking forward to one about Colorado! If you enjoy boondocking (dry camping), saving money, and witnessing spectacular sights Marianne Edwards E-book series on RV Boondocking are for you. Each e-book (there are currently 3, Arizona, New Mexico & Texas with more titles on the way) is loaded with valuable information for campers on where to go boondocking, how to get there and what to do and see once you arrive. What I really enjoyed is how Marianne separates each state into sections making it easy to concentrate on a specific route you may want to follow, or a specific area of the state you intend to visit. Within each section she goes into great detail on what that area of the state has to offer; from what time of year it is best to visit the area to State & National Parks, monuments, attractions, facts, fees, wildlife, free camping, hiking, information on the local communities and so much more. 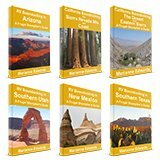 These books are well organized in an easy to read manner and the photographs highlighting some of the attractions makes you want to load up the RV and hit the road right now. If you are planning to visit any region of any state Marianne has written about don't leave home without the e-book. It is a valuable guide to getting the most out of your trip while saving the most too. Whether you camp in a tent, dry camp in an RV or camp with all of the amenities these e-books offer something for everyone. As an added bonus when you order an e-book you will receive Marianne's RV Basic Boondocking e-book free of charge. It is a great primer on what boondocking is and it is full of tips and tricks to save you money and make the most out of all of your boondocking experiences.